These adorable bunny cake pops from My Little Cupcake Blog are a hoppin' dessert. Chocolate brownies are combined with chocolate buttercream to form the bunny face. The bunny ears are cut out of gum paste (with the help of a cookie cutter) and then sculpted to look more realistic. The brownie balls are dipped in white candy melts and decorated with candy. 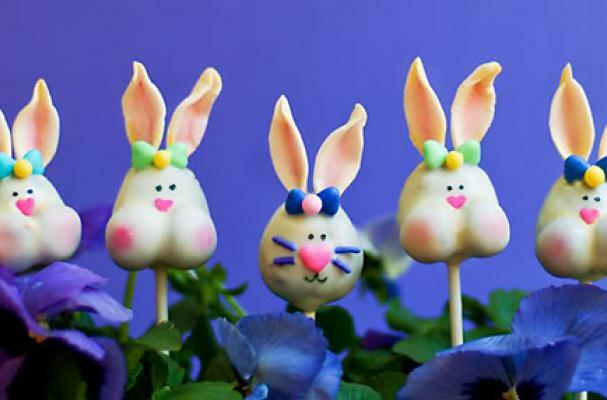 Bunny cake pops are an impressive sweet to make for Easter Sunday. For full decorating instructions, click here. It seems that shopping list is little too long, but the result is great. They are so cute! Cute, but it looks like they have breasts on their faces.